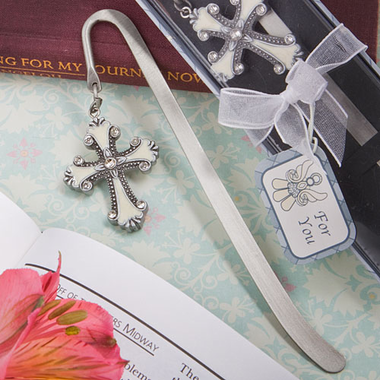 These Christian bookmarks are perfectly suited to hold your place in your favorite Bible or other religious reading material. The religious bookmarks are beautiful without being flashy. The bookmarks are wonderful added to a gift bag for your child?s baptism, or tuck them into an Easter basket to encourage a literary treat. Each 5 ?? x 1 ?? favor is made of a long stem design silver metal page marker with a pewter colored poly resin cross shaped charm with rhinestone accents dangling from its top. A black staging insert holds the favor inside a two-piece box with a clear top, and a grey and silver argyle and white cross patterned bottom. A ?For You? tag with a matching cross design is attached by a white organza ribbon wrapped around the package. You may also purchase personalized hang tags or stickers for an additional $.35 each. If you select the hang tags they come pre-punched with a round hole and include a 5" long white elastic string (not attached). You have your choice of tag/sticker shape - Diamond (1.75" x 1.75") or Round (1.75" diameter), background color and design.